We here at Steven Brown are committed to bringing our customers the most up-to-date fire protection equipment possible. 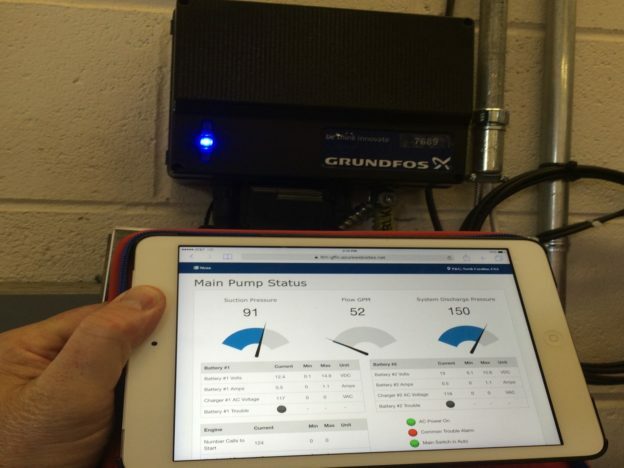 That’s why we are happy to team with Grundfos and bring a revolutionary new way for monitoring fire pump systems. It’s called FireConnect™, and it’s the future of fire protection. FireConnect™ is a Cloud-based monitoring system designed to optimize your fire pump system 24 hours a day, 7 days a week. It provides up-to-date, real-time status updates from any fire pump system in your portfolio. With FireConnect™, you will be the first to know about any potential fire emergencies and provide important information for first responders should the need arise. This system is capable of being used with any pump make or model, so there’s no need to change your fire pump in order to use FireConnect™. Whether your fire pump is new or retrofit, you can utilize the life-saving technology provided by FireConnect™. Our retrofit software is currently compatible with next generation microprocessor controllers from the following manufacturers: Tornatech, Firetrol and Eaton. This allows you to have access to 50+ alarms and feature active on your system at once. The most innovative technology introduced with FireConnect is the “diagnose to dispatch” technology, versus the traditional “dispatch to diagnose” tactic. With FireConnect™, you can monitor water supply, pump flow, and even active available water measurements if your water supply comes directly from a storage tank. FireConnect™ can also make routine maintenance and code compliance as simple as possible. Monitor Jockey Pump starts and stops for excessive use as a means to detect leaks or problems with your sprinkler system. This information makes for shorter, less frequent down times and easier parts stocking. You can also easily review a complete history of the pump’s use for both flow and non-flow tests, making code compliance a breeze. Using the knowledge at your disposal with this system, you can make the determination whether or not to make the call to emergency responders for assistance, rather than first responders arriving without prior knowledge of the situation. Now, you will have the peace of mind that your system is fully functional and prepared if an emergency occurs. There’s nothing worse than worrying your system might fail in an emergency; erase that fear for good through FireConnect™’s constant and customizable alert and access system, which will notify you of any errors or potential failures before a problem arises. How Can I Get FireConnect™? Contact Steven Brown Associates, Inc. to speak with us today about linking your fire pump with FireConnect™. If your system is compatible, you’re just a few steps away from complete control and security in your system. We want to give you the ability to monitor and control your system from the comfort of your home or office; get started today and provide the safety your facility and employees deserve!